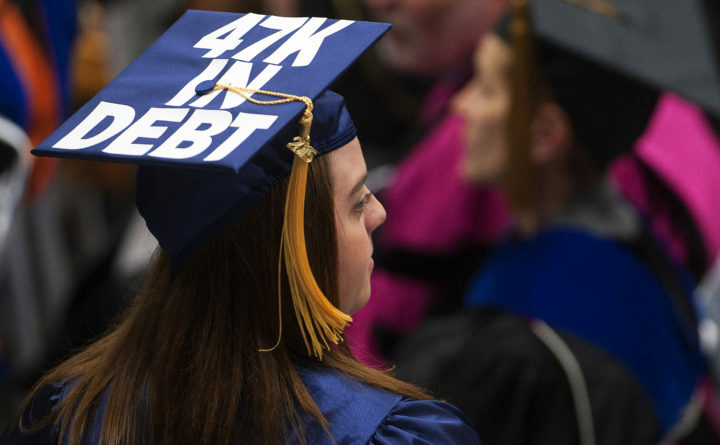 A graduate with their debt amount on their hat makes her way to the stage to receive her diploma during the 150th anniversary year graduation at the University of Maine in Orono, May 9, 2015. In their 2015 song “Stressed Out,” the band Twenty One Pilots had a line lamenting student loans. Atlantic writers Conor Friedersdorf and Megan Garber declared the song to be the anthem of the millennial generation. Many educated millennials would likely agree — since 2006, student debt has approximately doubled as a share of the economy. The increase seems to have paused in the past two years, possibly due to the economic recovery (which allows students and their families to pay more tuition out of current income) and a modest decline in college enrollment. But the burden is still very large, and interest rates on student-loan debt are fairly high. New information sheds light on just how bad things have gotten for student-loan borrowers. Education researcher Erin Dunlop Velez crunched data that was recently released by the Department of Education, and found that only half of students who went to college in 1995-6 had paid off their loans within 20 years. Given the vast increase in the size of loans since then, repayment rates are likely to be even worse if nothing is done. Velez also found that default rates are considerably higher than had been thought. To make matters worse, a recent report from the Roosevelt Institute, a think tank, finds that the increased burden has fallen especially heavily on black households. That comes as little surprise, given that black households tend to be poorer, and thus are less able to pay for their kids’ tuition out of their current income. If poor kids’ economic futures are being crushed by debt, while rich kids remain relatively unencumbered, the student loan system isn’t exactly providing the disadvantaged with a leg up. Some people may feel little sympathy for the problems of student borrowers, reasoning that the educated class doesn’t need a bailout when college-degree holders already earn much more than others. But it’s students from poorer backgrounds, trying their best to climb up the ladder of opportunity, who get hurt the most. What’s more, afflicting educated people with huge, hard-to-repay debt burdens isn’t a good way to fight inequality. Because debt constrains borrowers’ life options, it prevents them from starting businesses that might have employed non-college-educated Americans and raised labor demand — one possible reason that business-formation rates are falling is because educated people are too indebted to take on the additional risk of founding a startup. Student debt also makes it harder to buy a home or start a family. What’s more, student lending has almost certainly contributed to the rise in college tuition, which has outpaced overall inflation by a lot. When the government lends students money, or encourages private lenders to do the same, it increases demand for college, pushing up the price. If the loans are subsidized, that represents a transfer of money from the taxpayer to the university. If the easy availability of loans nudges inexperienced 18-year-olds to spend more money on college than they otherwise would, the loans represent a transfer from the borrower to the university. Either way, the money isn’t flowing into the pockets of future workers, but to university coffers, where some of it gets used to offset reductions in state funding for higher education, and some gets spent on salaries for an ever-expanding army of administrators. All of this raises the possibility that the entire student loan system is, in the words of one Roosevelt Institute researcher, a “failed social experiment.” The National Defense Education Act of 1958 and the Higher Education Act of 1965 got the government into the business of guaranteeing and subsidizing student loans, as a means of creating a more educated workforce and boosting equality of opportunity. In 2010, the Student Aid and Fiscal Responsibility Act effectively nationalized the student-lending industry, eliminating guaranteed loans and replacing them with direct government lending to students. The percentage of student debt held by the federal government rose from about 30 percent to almost 80 percent. Student loans now comprise about 45 percent of the federal government’s total financial assets. This means that not only are loans hurting the people they’re supposed to help, but they have given the government a strong incentive not to change the system. It will be an uphill political battle to push the federal government to forgive student loans. But some form of loan forgiveness, especially for the hapless generation that graduated during the Great Recession, is in order. The government also needs to shift the way it does student aid. More grants, and fewer loans, should be the order of the day. These grants should flow entirely to disadvantaged students. Reducing loans for the well-off and replacing them with grants for the poor won’t solve the problem of high tuition — only increased state funding, coupled with stringent cost controls, will do that. But it will shift more of the burden of tuition onto those most able to pay it, and do a better job of equalizing the playing field. It will also result in a more dynamic economy that hasn’t hamstrung the next generation of workers.